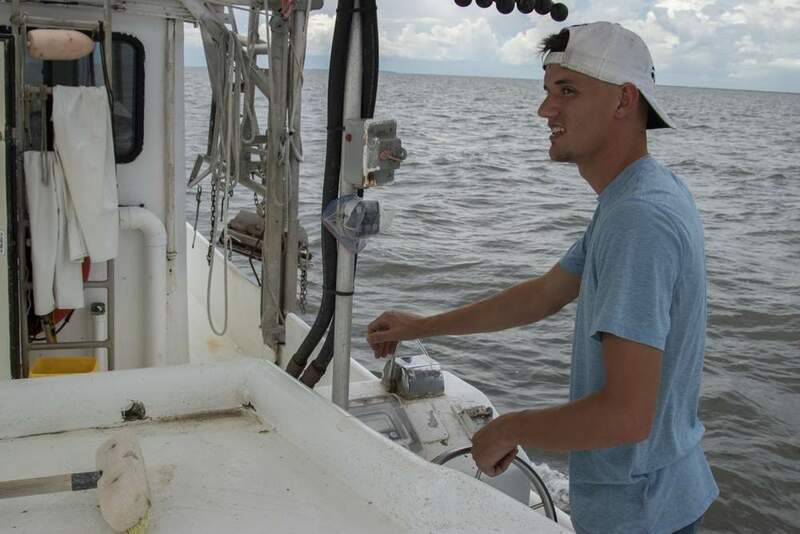 ANN ARBOR—A University of Michigan researcher and his colleagues are forecasting an average but still large "dead zone" in the Gulf of Mexico this year. The forecast calls for an oxygen-depleted, or hypoxic, region of 5,483 square miles, roughly the size of Connecticut. It was announced today by the U.S. National Oceanic and Atmospheric Administration, which sponsors the work. Farmland runoff containing fertilizers and livestock waste, much of it from as far away as the Corn Belt, is the main source of the nitrogen and phosphorus that cause the annual Gulf of Mexico hypoxic region, which is also know as a dead zone. In its 2001 action plan—which was confirmed in 2008 and again in 2013—the Mississippi River/Gulf of Mexico Watershed Nutrient Task Force set the goal of reducing the five-year running average areal extent of the gulf hypoxic zone to 5,000 square kilometers (1,950 square miles) by 2015. The task force is a coalition of federal, state and tribal agencies. But little progress has been made toward that goal. Since 1995, the gulf dead zone has averaged 5,911 square miles. 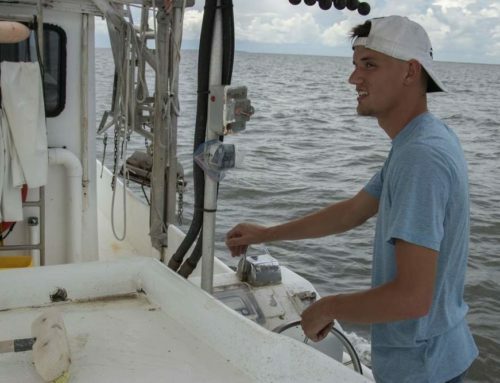 "The size of the annual Gulf of Mexico dead zone varies from year to year in response to changing weather patterns, primarily in the Corn Belt," said U-M aquatic ecologist Don Scavia, director of the Graham Sustainability Institute. "But the bottom line is that we will never reach the action plan’s goal of 1,950 square miles until more serious actions are taken to reduce the loss of Midwest fertilizers into the Mississippi River system, regardless of the weather," said Scavia, who is a member of NOAA-funded teams that produce annual forecasts for the Gulf of Mexico, the Chesapeake Bay and Lake Erie. 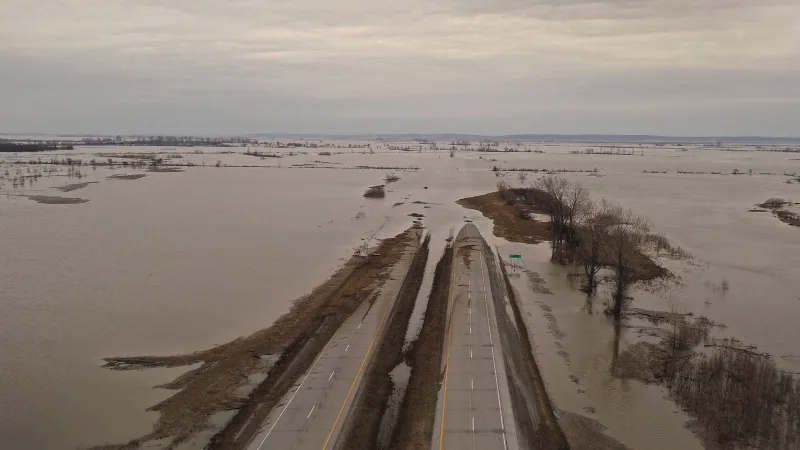 Nutrient-rich runoff from farming states ends up in the Mississippi River and eventually makes its way to the gulf. The amount of nitrogen entering the Gulf of Mexico each spring increased by about 300 percent between the 1960s and 1980s, mainly due to increased agricultural runoff. Nitrogen levels have changed little since then. In the gulf, nutrient-rich waters fuel large algae blooms. When the algae die and sink, bottom-dwelling bacteria decompose the organic matter, consuming oxygen in the process. The result is a low-oxygen (hypoxic) or oxygen-free (anoxic) region in the bottom and near-bottom waters: the dead zone. Fish and shellfish either leave the oxygen-depleted waters or die, resulting in losses to commercial and sports fisheries. In the gulf, the dockside value of commercial fisheries was $629 million in 2009, and nearly 3 million recreational anglers contributed more than $1 billion to the region’s economy. This year marks the first time the results of four models were combined to make the hypoxia forecast. The four model predictions range from 4,344 to 5,985 square miles. When variations in weather and oceanographic conditions are factored in, the "collective predictive interval" of the models ranges from 3,205 to 7,645 square miles. 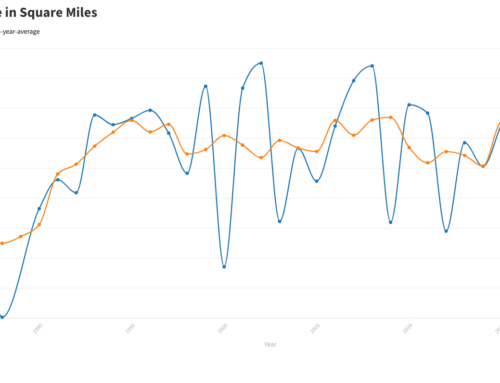 The NOAA-sponsored Gulf of Mexico hypoxia forecast has improved steadily in recent years, a result of advancements of individual models and an increase in the number of models. Forecasts based on multiple models are called ensemble forecasts and are commonly used in hurricane and other weather forecasts. The ensemble models for the 2015 forecast were developed by NOAA-sponsored teams at U-M, Louisiana State University, the Louisiana Universities Marine Consortium, the Virginia Institute of Marine Sciences/College of William and Mary, North Carolina State University and the U.S. Geological Survey. "NOAA, along with our partners, continues to improve our capability to generate environmental data that can help mitigate and manage this threat to gulf fisheries and economies," said Kathryn Sullivan, under secretary of commerce for oceans and atmosphere and NOAA administrator. 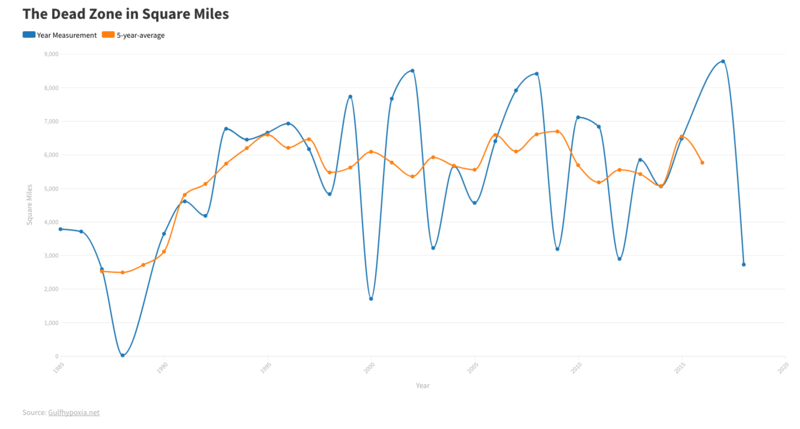 "We are adding models to increase the accuracy of our dead zone forecast." 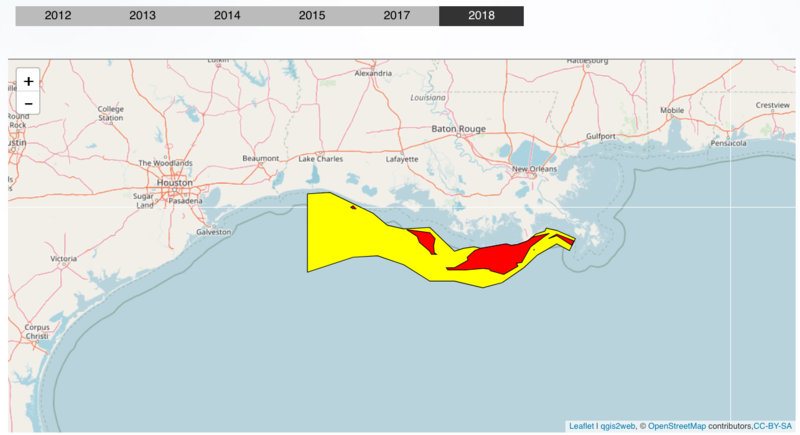 The Gulf of Mexico hypoxia forecast is based on nutrient runoff and streamflow data provided by the U.S. Geological Survey. The agency operates more than 3,000 real-time stream gauges and 50 real-time nitrate sensors. It collects water-quality data at long-term stations throughout the Mississippi River Basin to track how nutrient levels change over time. 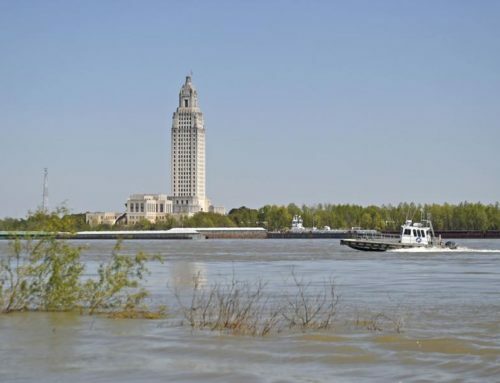 The USGS estimates that 104,000 metric tons of nitrate and 19,300 metric tons of phosphorus flowed down the Mississippi and Atchafalaya rivers into the Gulf of Mexico in May 2015. That’s 21 percent below the 1980-2014 average for nitrogen and 16 percent above the long-term average for phosphorus. 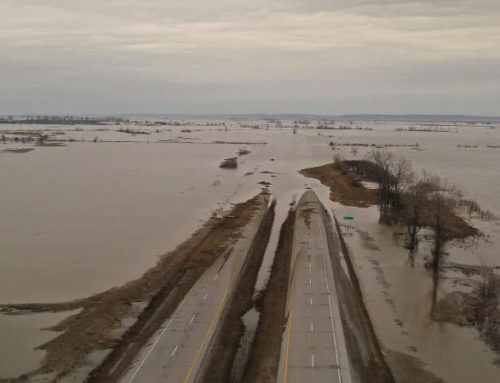 "Real-time nitrate sensors are advancing our understanding of how nitrate is transported in small streams and large rivers, including the main stem of the Mississippi River," said William Werkheiser, USGS associate director for water. "Long-term monitoring is critical to tracking how nutrient levels are changing in response to management actions and for improving modeling tools to estimate which sources and areas are contributing the largest amounts of nutrients to the gulf." 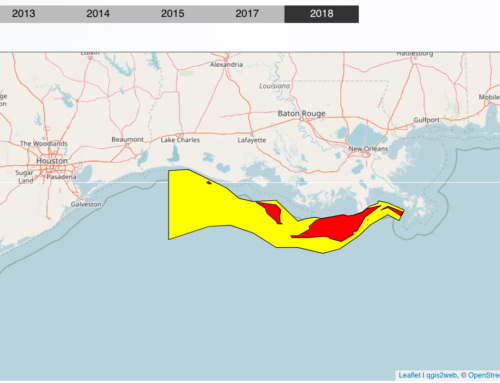 The confirmed size of the 2015 Gulf of Mexico hypoxic zone will be released in early August, following a monitoring survey led by the Louisiana Universities Marine Consortium.